Plug & Play. Easy to use. Single button control for simple operation backed by a 1 manufacturer’s assurance. Ideal for in-ground pools up to 50 feet. No random patterns. CleverClean Technology scans your pool and uses advanced algorithms to efficiently clean your pools floor and walls. Dual scrubbing brushes give twice the cleaning power to attack tough dirt. Large bottom-load cartridge filters combined with a high suction rate captures leaves and fine debris leaving your pool sparkling clean in 3 hours. Hassle free cleaning. Anti-tangling patented swivel cable allows the Nautilus to move around your swimming pool with ease. No hoses or booster pumps required. 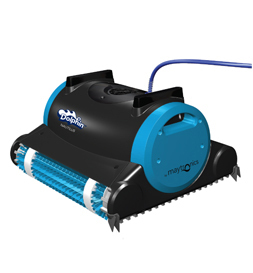 Dolphin Robotic Pool Cleaners are 8X more energy efficient than suction and pressure cleaners. The Dolphin Nautilus is lightweight and easy-to-use, with exceptional performance at an affordable price.